The Egyptian Exchange (EGX) is likely to see an upward trend this week after Fitch Ratings upgraded Egypt’s long-term foreign-currency issuer default rating (IDR) ratings to ‘B+’ from ‘B’. Liquidity volume is expected to rise this week on the back of Fitch’s upgrade to Egypt’s IDR with a ‘Stable’ Outlook, head of the capital market committee at the African Economic Council Ayman Fouda told Mubasher. This will attract foreign institutional investments, in line with anticipation of the Central Bank of Egypt’s (CBE) meeting and the extraordinary meeting (EGM) of Global Telecom Holding which will impact the indices of the EGX this week, Fouda said. The benchmark EGX30 index may retest 15,076 and 15,330 points if it breaks main resistance at 14,810 and 14,930 points, Fouda highlighted. For his part, Osama Naguib, head of technical analysis at Arab Finance Securities, said that the EGX30 index would see further purchases after recently hovering around the main support level of 14,600 points. Trading volume is less than average which is a negative sign indicating that the Egyptian bourse would not carry on the upward trend, Naguib added. On the other hand, he noted that most stocks saw several sell-off, adding that purchasing powers are expected to emerge to push the benchmark up. 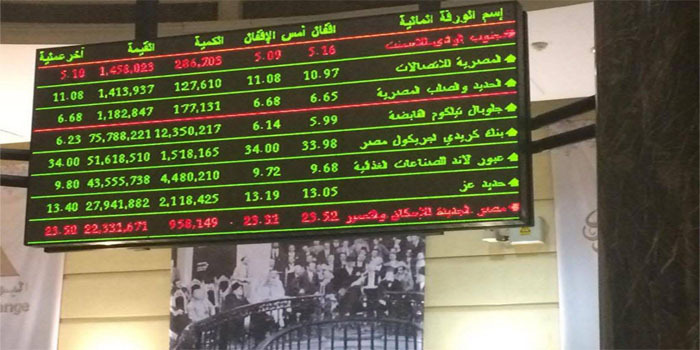 It is worth noting that the EGX closed the third week of March 2019 in the red territory amid profit-taking activity.